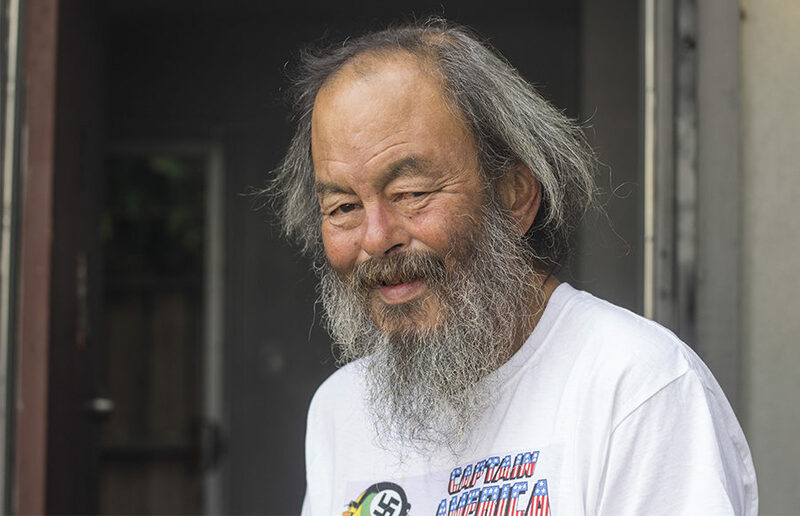 On Sept. 13, with all personal belonging tucked between his arms, Guy “Mike” Lee left the South Berkeley homeless encampment he had called home for the last time. The walk wasn’t long. In about seven minutes, he had arrived at his new home — his very own apartment on Fairview Street. Lee, 62, moved to the Bay Area permanently when he was 17 and has spent much of his time since then living on the streets of Berkeley. 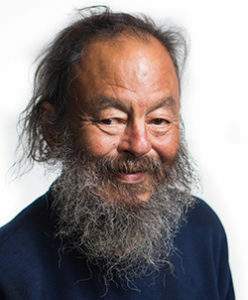 A kind of local celebrity, Lee is best known for his passionate advocacy for homeless rights and housing in the city; he even ran for mayor in the 2016 elections. After decades of calling a tent his home, he finally received the keys to permanent housing last week, giving him a place of his own and a place to work with the homeless community. But the path to moving in was not easy for Lee. About four weeks ago, the Hub presented Lee with a housing opportunity, but in East Oakland, Lee alleged. He said he was hesitant about accepting because it was a very small studio apartment — barely big enough to house his own tent — and it was so far away from the community he had become close to in Berkeley. He said he “reluctantly accepted” the unit, however, because his only other option was to spend another winter on the streets. Lee said he signed the lease and completed all the necessary paperwork. He alleged that the Hub said he would hear back about the housing opportunity in about a week. But two weeks later, he had still not heard back. Taking to social media to express his frustration, he posted on his Facebook page about the situation and emailed city council members for help. The Hub, launched in 2016, has faced criticism in the past for its alleged inefficiency in providing homeless community members with housing and other services. Some community members have said they feel that there is a “disconnect” between the homeless community and the Hub staff, alleging that the Hub has failed to provide services to the community. Mike Zint, founder of First They Came for the Homeless and former fellow camp occupant of Lee’s, said although he couldn’t really speak to the specifics of Lee’s situation, he had experienced something similar with the Hub. Zint alleged that he too had problems with his lease through the Hub that delayed his housing, but he acknowledged that there is a lot of “governmental bureaucracy” that could have caused the process to take such a long time. After Lee emailed council members about his situation, Councilmember Kriss Worthington said his office forwarded Lee’s complaint to staff members at the Hub to see if they could help expedite his housing. He added that there can often be “bureaucratic obstacles” that can delay individual housing cases. Citing the Hub’s confidentiality policy, both Terrie Light, executive director for the Berkeley Food and Housing Project, and Sharon Hawkins Leyden, director of the Hub, declined to comment on Lee’s case specifically. She added that there is no specific timeline for the process of housing one of the Hub’s clients because it varies depending on the client, landlord and other mitigating factors. Hawkins Leyden emphasized, however, that the Hub has a “really good” system that housed more than 75 households in the last year. On Sept. 11, about five days after Lee shared his story publicly, he received several calls from the Hub. 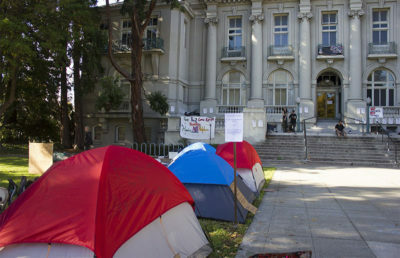 Although at first he ignored them because he was frustrated, when he answered, he was told that the Hub had found a new place for him — one that was not only in Berkeley, but also just a few blocks away from the homeless encampment on Adeline Street, which has been the site of some contention recently. 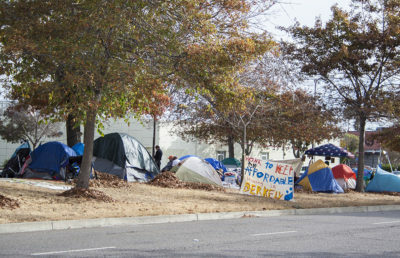 Although Berkeley Police Department officers have disbanded several homeless encampments in the city, many people in the homeless community have emphasized the stability that the encampments provide. According to Lee, he signed the new lease Sept. 12 and moved into the apartment the following day. He later found out that his landlord is former city councilmember Mary Wainwright, a woman he’s admired and wanted to meet for years. But being such a prominent figure in the community, Lee worries that his housing situation may have been resolved so quickly because of his status. It took four members of the council, as well as the mayor, he said, to speak on his behalf before his situation was resolved. Many community members expressed their excitement for Lee — someone who has been advocating for everything from tiny homes to more accessible restrooms for the homeless community. Worthington said he thought that it was “beautiful” that the Hub was able to find Lee a second offer for an apartment, especially one in Berkeley, since Lee is such an “important voice to raise serious issues” in the community. “I think any day that we get a homeless person off the street into an apartment is a good day. Because he’s such a part of the Berkeley community with his activism, it’s even better that he’s in Berkeley,” Worthington said. Zint, who was eventually able to move into his own apartment in East Oakland earlier this year, also said he was very happy for Lee. Since moving to Oakland, however, he acknowledges that he is “a ways out” from Berkeley and hasn’t been able to attend city council meetings, particularly because of health problems. Still, the two of them continue to work together to address the major issues facing Berkeley. The housewarming gifts have already started to roll in. Lee said one of his friends in Oakley, California, was sending him a microwave for his kitchen. Lee also got to celebrate his 62nd birthday with his friends in his apartment Tuesday. He said it was “a good birthday” and that it was “just awesome” to celebrate it with his community in his new home. But while his fight for his own home has come to an end, Lee has no plans to stop fighting for the homeless community. He said his apartment will be an “epicenter” for the homeless community, offering himself and his friends on the streets a “more stable base of operations” — for instance, providing a more secure place to store any donations they receive. Lee emphasized that although he is now off the streets, there are many more who are still struggling to find proper housing.